Looking for a professional contractor to install holiday lights on your home or commercial property in North County San Diego? You’ve come to the right place. Winter Illuminations of North San Diego offers Christmas light installation services for fine homes and commercial buildings in the communities of La Jolla, Cardiff-by-the-Sea, Carlsbad, Carmel Valley, Del Mar, Encinitas, Olivenhain, Rancho Santa Fe, Solana Beach, Oceanside, Vista, San Marcos, Lake San Marcos, Poway, Hidden Meadows, Fairbanks Ranch, Rancho Bernardo, Coronado and La Mesa in the 92007, 92008, 92009, 92013, 92014, 92018, 92023, 92024, 92036, 92037, 92038, 92039, 92092, 92093, 91941, 91942, 91943, 91944, 92128, 92067, 92091, 92075, 92118, and 92178 zip codes. Call Bruce Merz at 619-508-9278 for a free consultation. 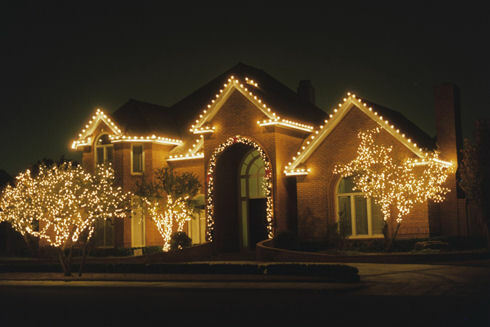 Tell us about what type of holiday lighting display you are looking for and we will ensure you are the envy of the neighborhood. We can help you design a custom holiday lighting package that is perfect for you; whether you want to get the most out of your budget or want to go all out, we can help. If you are not sure exactly what you want, we can offer three or four different packages that you can choose from. Typically the first package is just the roof line and priced by the sq ft. The second option is typically the roof line plus the sides of the home. And from there you can add adding trees and bushes, garland on columns, wreathes, or lights around windows or doors. We take care of everything for you — design, install, service/maintenance, and takedown. Our goal is for you to enjoy the holidays without the hassles. We use only the highest grade commercial lighting materials that are backed by a 3-year warranty. You buy the lights the first year and they will be custom fit to your home or property. No extra cords or bulbs. At the end of the year, your lights will be carefully removed, labeled and placed in storage bins. You can store them or we can store them for you. Then if you like us and we took good care of you then we will put them up again the next year for a discounted price. Our installers are trained in electrical safety and electrical consumption guidelines for both incandescent and LED lights (watts per bulb, max run length per line, and max amperage for both 15 and 20 Amp circuits) and receive instructions in best practices from our most experienced master installers. In the rare case that a follow-up service call is required we will promptly address your concerns. Our goal is to have you come back year after year because we do good work and take excellent care of our customers. Winter Illuminations of North County San Diego is a licensee of Winter Illuminations Inc and authorized to use the Winter Illuminations brand and unique style of holiday lighting services in North County San Diego, CA. Bruce Merz of San Diego is the owner. “We are a family owned business that is dedicated to providing the most beautiful Christmas lighting displays for the holidays”. Bruce grew up in San Diego and graduated with a degree in Business Administration from San Diego State University. After graduating he considered multiple opportunities to start a business but decided that a Christmas Light design and installation business would be a valuable and needed service for the community. How can we be of service? Click below to request a free consultation.